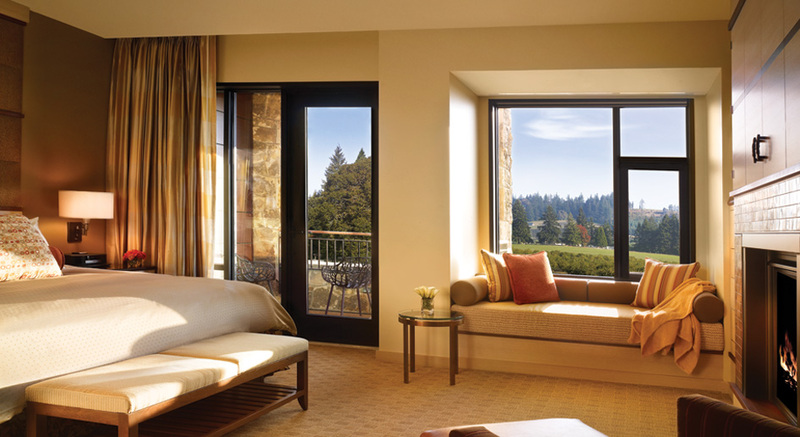 The Allison Inn & Spa, Oregon is located on immaculate grounds on 35 acres. It beckons guests with fragrantly elegant gardens and pathways connecting to our vineyards and picnic area. Meeting, social and wedding settings are unmatched and thoughtfully designed with terraces and views. It is the most lovely setting in all of Western Oregon and also one of the most lovely in the western USA. You’ll notice the hotel’s special attention to detail in the design of their deluxe guestrooms and suites. Either a terrace or balcony with sliding glass doors and custom outdoor furniture. Gas fireplace with copper tile. Hospitality foyer with wet bar and mini fridge. Desk/table area made of solid Oregon walnut. Spa-inspired bathrooms featuring spacious soaking tubs with translucent sliding panels, providing views of the hearth and bedroom area. Porcelain tile floors, walnut and quartz stone vanities. Interior earth tone color palette of lichen, bark, berry, pear, beet and squash inspired by vineyards and nearby farmlands reflecting the wine country’s four seasons. White Oak and walnut inlay custom cabinetry with quartz-stone surfaces throughout. Down duvets and pillows, luxurious bathrobes and the finest linens assure ultimate comfort and rest. Sculptural wood bowls and other unique accessories. At the signature restaurant JORY, the menus will accentuate the native flavors of the Willamette Valley with a strong influence on seasonality and bountiful local agriculture, and an affinity for wine pairing. Embracing thoughtful service and being well educated, the highly trained service staff will graciously offer to customize your wine pairing to complement the cuisine ordered. In-room dining menus, private dining and catered affairs will also be created under a similar focus. The Wine Cellar Selection offers an expansive collection of local and international wines. The primary focus will be to showcase local vintners, featuring a good selection of half bottles and wines from boutique and undiscovered nearby wineries. A comprehensive selection of featured local wine will include a balance of representation from neighboring states, California and Washington, as well as other wine regions; France, Germany, Italy, Australia, Hungary, New Zealand, South Africa, Austria, Spain and Lebanon. JORY’s wine list will aspire to highlight interesting facts from the menu; ie, “Women Wine Makers We Love”; certain vineyards where several wineries all produce the same varietal and create special wine flights, describing unique similarities or distinctive comparisons; three Pinot Noirs all grown in JORY soil. Boasting a 700 wine label cellar and pouring 50 wines-by-the-glass, there is no question that there are numerous selections to please even the most seasoned palate. Additionally, the Celebrity Wine Tender Evenings on Thursdays are an informative opportunity to personally meet the winery owner or winemaker as you sample their complimentary wines. A gathering place for resort guests to mingle at 6:30-7:30 PM in the Living Room. Stylish country weddings in stunning facilities can accommodate from 10 to 400 guests. If you prefer an outdoor wedding, feel free to exchange your wedding vows in the breathtaking, glorious garden settings. Your guests will be well taken care of in spacious and well-appointed accommodations, enhancing their weekend experience with all of the amenities that come with luxurious guestrooms and suites. Please remember to reserve early so that we can fulfill your specific requests. As you might imagine, wine tasting & touring can be arranged by private car and driver, or larger vehicles if necessary. In addition The Allison’s spa services are designed to provide the ultimate in comfort and relaxation for men and women alike. With 15,000 square feet dedicated to health, wellness, pampering and a touch of indulgence, neither stress nor worry can survive this environment. Fill out our contact form to request a Spa Menu. Prices vary depending upon the season. We can coordinate airfare to Portland in addition to private transportation to and from the Inn.